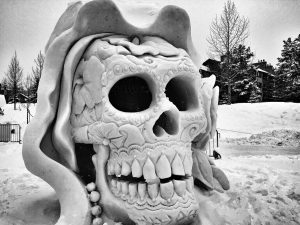 The Breckenridge, Colorado – International Snow Sculpting Competition is an annual event that draws thousands of locals and visitors to the core of the historic district in downtown Breck. Teams brave the sun, cold and wind of a high alpine environment to work with tons of snow, stomped on by hundreds of volunteers to create a square blank canvas of solid snow. Creativity, hard work and execution come together over a week of carving before the time limit and judging. I’ve seen some delicate pieces crash before the judging. If you can see the teams working on the sculpture before the deadline, I would highly recommend it. It’s fun to see the different roles that team members take. You can see it’s a collective effort from a group of dedicated people working with a temporary medium, and producing amazing exhibits that brings families together to spend time together. It’s one of my favorite events in Breckenridge, just for its originality and uniqueness. I’ve shared videos to the blocks and then to a longer, carving section of clips. The final designs are showed at the end. But, I wanted to show the artists at work. Because that’s how I saw them. It was fun to put these together, and I try to put out an album or group of images of both carving in action, and final designs, so please come back to this blog and our social profiles to see more fun images of the snow sculptures in Breck and other mountain life scenery, community info and Summit County, Colorado MLS highlights and featured homes. Please contact us to learn more about this event and other lifestyle amenities from living in the high country.